If you haven’t already requested it, this one’s still available. Click here to visit the Miracle Whip youtube page. Then click “Free Sample” at the top. On the next page you’ll be able to fill out the form to receive two free samples of Kraft Miracle Whip. Please allow 4-6 weeks for delivery. 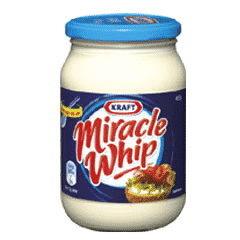 Great on sandwiches, potato salads, tuna fish salads, Devil eggs, etc I love Miracle Whip…. i will try it and buy it. Miracle Whip is the only one. I use miracle whip everyday.